There are several different platforms from which people can watch whales and dolphins, each with their own advantages, as well as potential impacts on the whales and dolphins being watched. Below is a summary of the different ways that you can watch whales and dolphins, as well as some tips on how to minimize the impact that your whale watching has. Land-based whale watching: Land-based whale watching has the enormous advantage of having almost no impact on the whales and dolphins that are being watched. Many places around the world feature fantastic cliff-top or shore-based view-points where resident groups of coastal dolphins, porpoises or killer whales can be observed, or where migratory species like right, humpback, or gray whales pass close to the coast, offering magnificent views. Some countries advertise whale routes that tourists can follow, linking shore-based whale watching locations, such as the Cape Whale Route in South Africa. 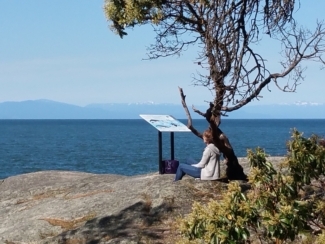 The Whale Trail on the West coast of the USA and Canada features a 1000km long network of shore-based viewing points that are featured on a website, soon to be linked with a smartphone App. These locations include signboards and information about the marine mammals that can be observed from each point. In the Netherlands, a shore-based view point includes a harbour porpoise “studio” where visitors can listen to live transmissions of the porpoises’ vocalizations, broadcast from an underwater listening station just offshore. Land-based whale watching is an optimal choice for those who suffer from sea-sickness, or want to be 100% certain that they will not contribute to the potentially negative impacts of vessel noise and vessel traffic around whales and dolphins. 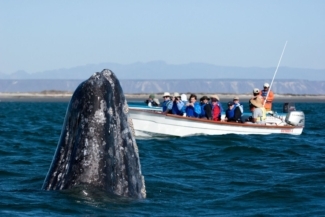 Boat-based whale watching: The most common form of whale watching is boat-based whale watching. Vessels that take tourists out can vary from small zodiacs or open-decked fiberglass or wooden vessels, such as those used by ex- or part-time fishermen in Loreto Bay Mexico or Chilika Lagoon India, to specially-built double-decked vessels that can accommodate hundreds of passengers, such as those used in the Gulf of Maine on the east coast of the USA. Boat-based tours can provide tourists with closer views of whales and dolphins in their natural environment, and inspire awe and wonder through these at-sea encounters. However, participants need to be aware that sea conditions can vary by season or even time of day, and should be prepared for the potential discomfort of rough seas, inclement weather, or seasickness. Vessel-based whale-watching also has significant potential to negatively affect the whales and dolphins that are targeted. The underwater sound generated by boat engines can mask whale and dolphin communication and potentially even damage their hearing. Furthermore, the constant presence of vessels may interrupt important activities like feeding or resting. As such, tourists are encouraged to choose their operator wisely by asking a number of questions when booking a boat-based whale watching tour. By asking these questions, tourists can demonstrate that they are interested in minimizing impacts and helping to enforce regulations designed to protect whales and dolphins. Many whale watching locations have either legally enforced or voluntary guidelines that whale watch tour operators are encouraged (or legally mandated) to follow. Familiarizing yourself with the guidelines in place in your whale-watch destination will allow you to exert positive influence on the operator you choose by encouraging them to adhere to the guidelines. Research has shown that vessel approaches that adhere to minimum approach distances and correct approach angles are likely to result in longer and more rewarding interactions with the target animals than those during which vessels approach too closely, too quickly or in a manner that startles the whales or dolphins1. Recreational boaters operating their own craft also have a role to play, as studies have shown that non-licensed personally operated boats are as likely, if not more likely to cause disturbance through inappropriate approaches or boat handling around whales and dolphins2. Recreational boaters can educate themselves about regulations that are in place to protect whales and dolphins in their area and/or best practices to minimize their impact on whales and dolphins where no formal regulations are in place. Whale watchers on board a large whale watch vessel in the Gulf of Maine watching a humpback whale. Photo courtesy of Whale and Dolphin Conservation USA. Non-motorized boats: In some locations it is possible to kayak, canoe, or paddle-board among whales or dolphins. While this method of whale watching eliminates the disturbance from underwater engine noise, it still has the potential to impact whales and dolphins, as research shows they may perceive any type of vessel as a potential predator or an irritant, and respond with decreased resting and feeding and increased traveling2. The use of small non-motorized craft around large powerful killer whales or baleen whales also carries risks to the whale watchers, who may be at risk of injury if caught up in exuberant or competitive behavior between whales. In-water interactions: In-water encounters with whales or dolphins, otherwise known as 'swim with' programmes, are becoming increasingly popular around the world. A recent CMS commissioned report summarizes commercial in-water cetacean encounters offered around the world, as well as the management challenges associated with this activity. While many tourists report experiencing spiritual connections and life-changing moments during these in-water encounters, they carry significant risks for the whales and dolphins, as well as the humans involved. Humans are at risk of injury from the powerful animals with which they share the waters, as well as the unpredictable conditions of open ocean habitats. Whales and dolphins are at risk of disease or infection transmitted from humans; disruption of normal feeding, resting or socializing behaviour required to maintain their energy budgets; and injury from the hulls or propellers of vessels that must approach much more closely to drop swimmers in the water within viewing distance than they would for vessel-based whale-watching activities. 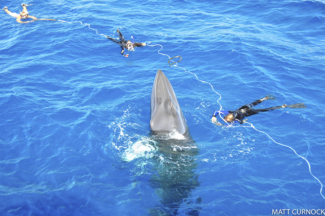 These risks can be minimized through proactive and well-monitored management measures, such as those used for swimming with spinner dolphins on the Samadai Reef in Egypt, and those employed by the swim-with dwarf minke whale industry on the Great Barrier Reef in Australia. 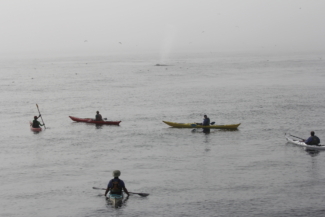 Kayakers with a humpback whale, Moss Landing California. Photo courtesy Whale and Dolphin Conservation USA. Swimmers experiencing an in-water encounter with a dwarf minke whale on the Great Barrier Reef in Australia. Photo courtesy of Matt Curnock. Aerial whale watching: In some locations it is possible to observe whales and dolphins from the air – either from helicopters or small planes that can be chartered specifically for this purpose. This is possible in South Africa, New Zealand, Australia and the United States. While expensive in comparison with boat-based or shore-based tours, aerial viewing provides an impression of the scale of whale and dolphin habitat, and can allow participants to cover more territory and thus find animals that are more widely dispersed. Aerial viewing can also impact whales through the sound and shadows generated, and regulations are in place in most areas where it is offered to establish minimum approach distances (e.g. vertical positions above whales or dolphins) and angles. 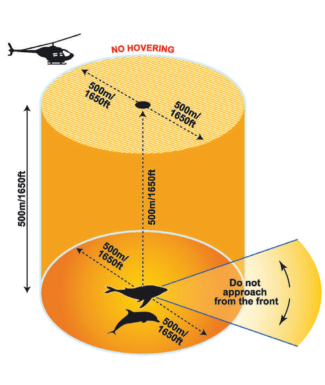 Approach diagram for helicopters from the Australian National Whale and Dolphin Watching Guidelines (2017). Hale, P. Interactions between vessels and dolphins in Port Phillip Bay. 71 (Victorian Department of Natural Resources and Environment., Melbourne, 2002).